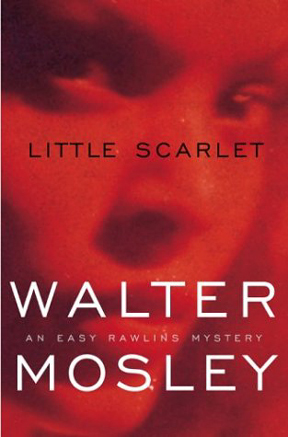 ''Little Scarlet'' by Walter Mosley is so filled with rage that I almost put it down. But Mosley's writing is so beautiful, so powerful, that I let the anger boil off the pages to the side of me while I stayed in it and finished what is a great novel, a significant addition to the story of America. It's a new chapter in Mosley's ongoing tale of Easy Rawlins, the private eye who isn't officially a private eye, in the mean streets of Los Angeles in the 1950s and '60s. All those excellent books that went before may well just be the set-up for ''Little Scarlet,'' which marks a sea-change in the life of Easy Rawlins and for millions of American blacks, because it takes place just at the end of the Watts riots, which are still referred to by many who were there as the Watts Uprising. ''You got working men and women all fenced in together brooding about what they see and what they can't have. ... They all come from the South. They all come from racism so bad that they don't even know what it's like to walk around with your head held high. They get nervous when the police drive by. They get angry when their children are dragged off in chains. Rawlins works as a school janitor part time but keeps an office with a sign that says ''EASY RAWLINS ... RESEARCH AND DELIVERY.'' He isn't licensed as a private detective, although that's essentially what the sign means. He tries to stay away from the L.A.P.D. That's as high up as power went in Los Angeles in those days, and it is not for nothing that Rawlins' help is needed. Seems a white man drove into Watts during the riots, was caught by a bunch of black men and beaten to a pulp before being saved by a black woman -- Little Scarlet. Trouble is, Little Scarlet turned up murdered a few days later and nobody can find the white man. The cops have Little Scarlet's body on ice, and her aunt in a clinic and medicated. Nobody else knows what happened. The cops don't want the riots to start up again over the killing, but can't investigate on their own in Watts. So they ask Rawlins to ask around in the neighborhood, without raising a fuss. Or a new riot. It's when the big-deal cops are talking to him that Rawlins starts to notice how the riots -- the uprising -- have changed his world. For instance, he talks back -- for good reason and with accuracy -- to a police caption. But, as he realizes, the time has come when the police boot is being removed from his neck. As he begins his investigation, he figures out almost immediately that the mysterious, missing white man probably did not kill Little Scarlet. If not, who did? Before long comes the great ironic realization of this novel, a marvelous bit of writing that will make it a study book for students of literature: Little Scarlet was probably killed by a black man; and not just any black man, but one who may have killed dozens of other black women before Little Scarlet. Rawlins' suspect is, in fact, someone he'd suspected before in another killing, but he could never get the police interested. Because before the riots, the L.A.P.D. just didn't care about black women getting killed in South-Central. Detective Suggs, who is a good guy, actually apologized to Rawlins about it. It wasn't his fault. Rawlins is beyond angry, and over the days of his investigation stays away from his family too long, gets beaten up thoroughly, is saved by voodoo medicine and doesn't get nearly enough sleep -- all in his passion-fueled quest to solve this crime before an innocent man is railroaded, before a guilty man goes free and to keep the riots from starting again, fresh and hot. On hand are Rawlin's friend Mouse and reference is made to his bookish friend Paris, and many other of Mosley's rich cast. There are no wasted words or subplots. Everything works to elucidate and edify. The real killer is found, and is another means for Mosley to lay on the irony with a mason's trowel.